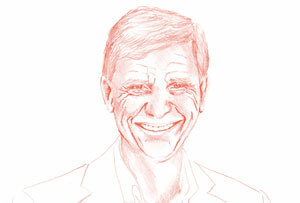 YOU LIVE & YOU LEARN: Hermann Hauser on how he started Acorn Computers and why biosciences will be the next big thing. 'Boy, you're going to learn English,' my father said when I was 15, handing me some language school brochures. 'It's the most important language.' The choice was Exeter or Cambridge. But the train connections were better to Cambridge. I did the same with my kids. I said you should go to Beijing to learn Chinese, and they did. Chris Curry came to me and said, 'I don't like working for Clive Sinclair any more. Why don't we start our own company?' 'Sure,' I said, 'How much does it cost?' He said, '£100, have you got £50?' 'Yes,' I said. 'But what are we going to make?' 'Microprocessors,' he replied. That's how we started Acorn. It was one happy community back then. Steve Jobs, Bill Gates, Larry Ellison - you got to know the personalities. The degree of arrogance differed, but if you took the average it was still way above. We knew we were the chosen people who were going to change the world. And we did! People still occasionally come up and thank me for the BBC Micro. My proudest achievement is contributing to educating a whole generation of software programmers. Silicon Fen is firing on all cylinders at the moment. The cluster effect is really working. The main change isn’t the technology, which has always been there, but the quality of management and access to VC finance. That’s probably why we haven’t produced our Google or Facebook yet. It’s having the roulette wheel going round for long enough to get a really big hit. We didn't see the mobile revolution coming. A big reason Acorn spin-out ARM was so successful is something I hadn't planned - low power, which is a side effect of us adopting RISC technology in our chips. It's an American invention, and an exception to the rule that the British invent and the Americans exploit. With the exception of machine learning, the real action is going to be in biosciences rather than computing. When I did Solexa, it revolutionised gene sequencing by reducing the cost from $10m to $1,000 in seven years, the most spectacular reduction at any time in any sector I’ve seen. I thought if this could happen in sequencing, are there other areas that could see this type of progress? So I went back to university and found out there’s a whole myriad of things. It’s very exciting. This migration issue is the first time in my life that I'm proud of being associated with Germany (Hauser was born in Austria) and ashamed of being associated with Britain. Germany has taken a million people. Britain's taking 2,000. I think it's a bloody scandal. An A team with C technology wins over a C team with A technology every time. I wish I'd known that earlier.